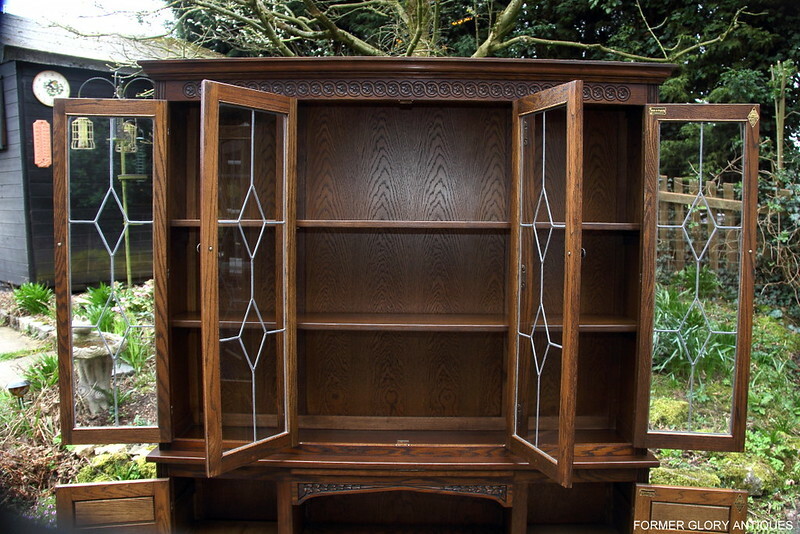 CARVED 'LIGHT OAK' 'LIBRARY BOOKCASE'. 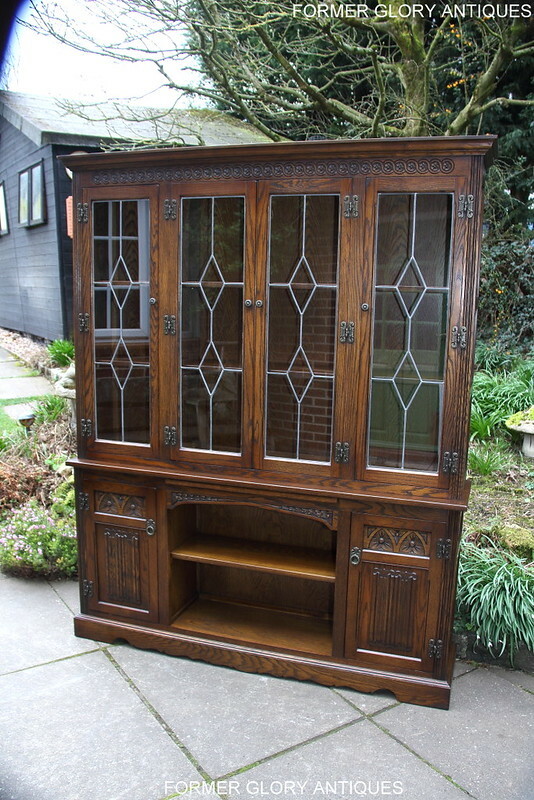 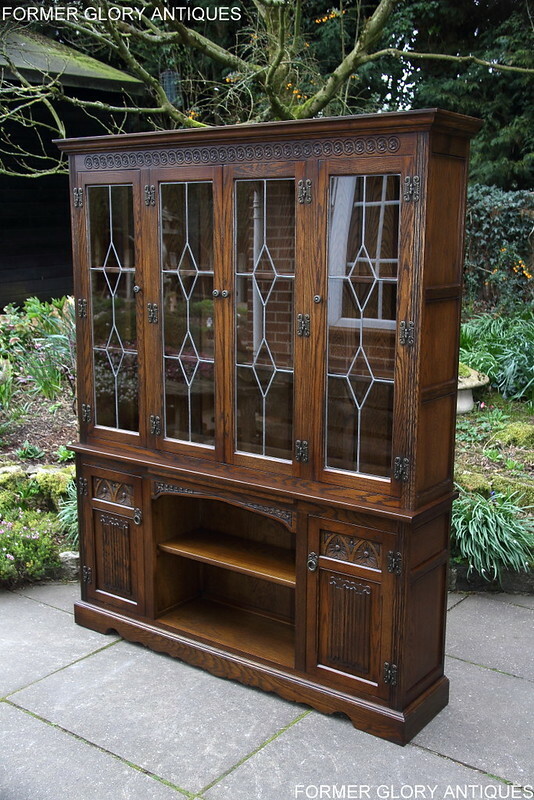 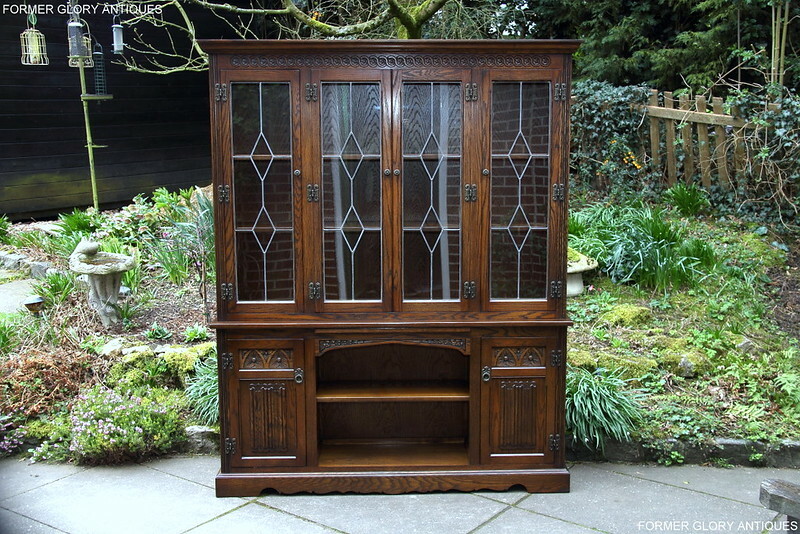 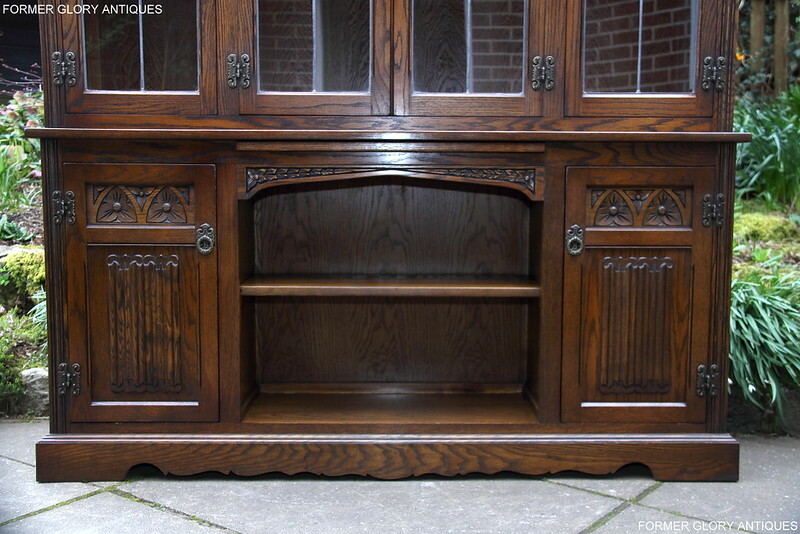 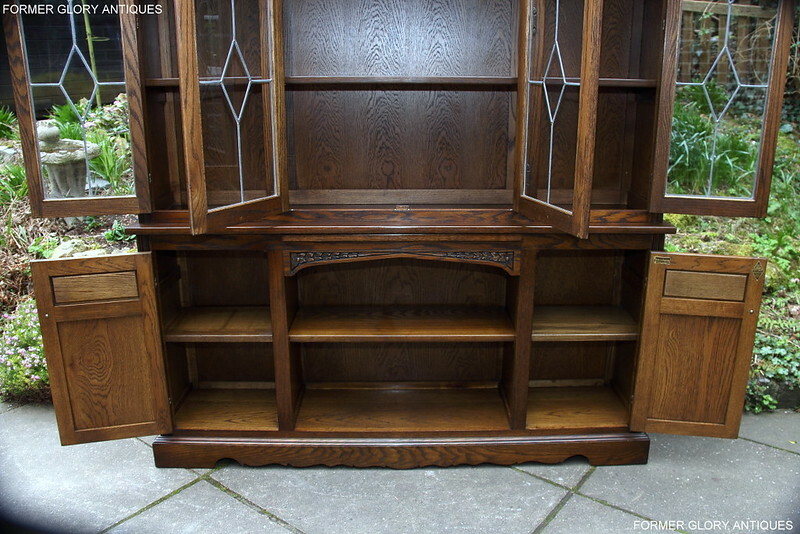 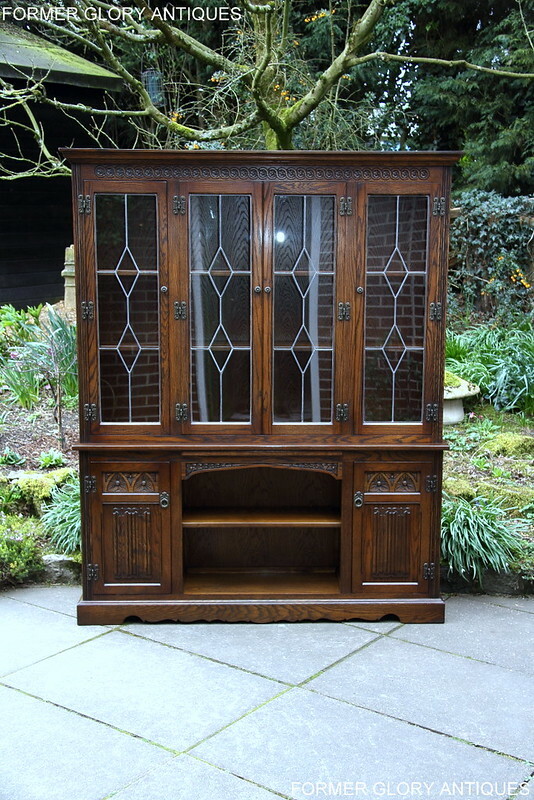 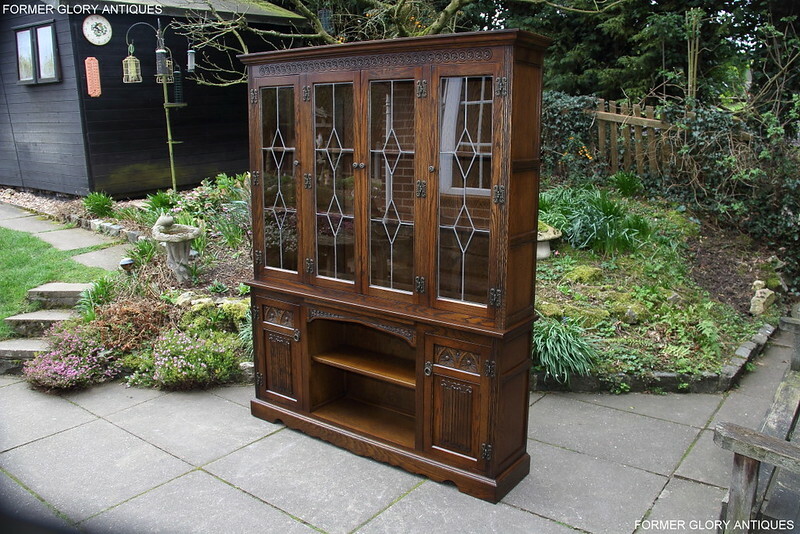 A VERY ATTRACTIVE, LATE 20th CENTURY, CARVED OAK, 'LIBRARY BOOKCASE', OF EXCEPTIONAL QUALITY AND CONDITION. 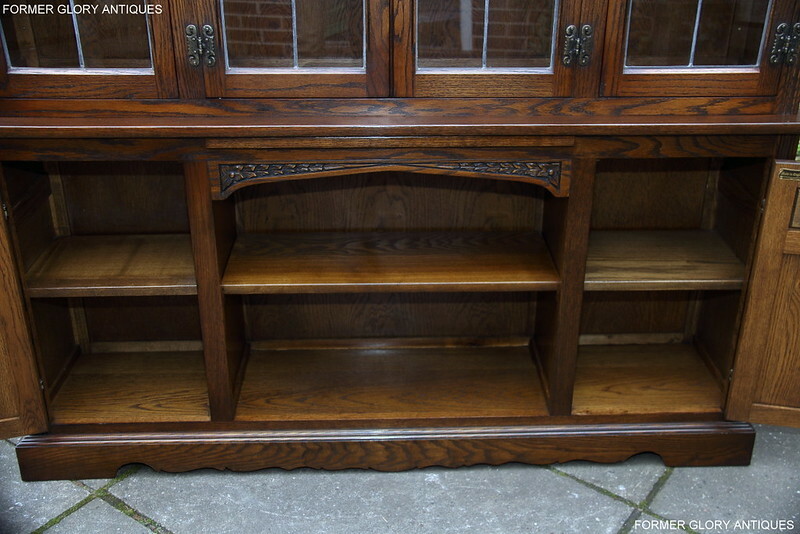 THIS FABULOUS OAK GLAZED BOOKCASE IS ENGLISH MADE BY ONE OF THE LEADING FURNITURE MANUFACTURERS IN TODAY'S MARKET PLACE. 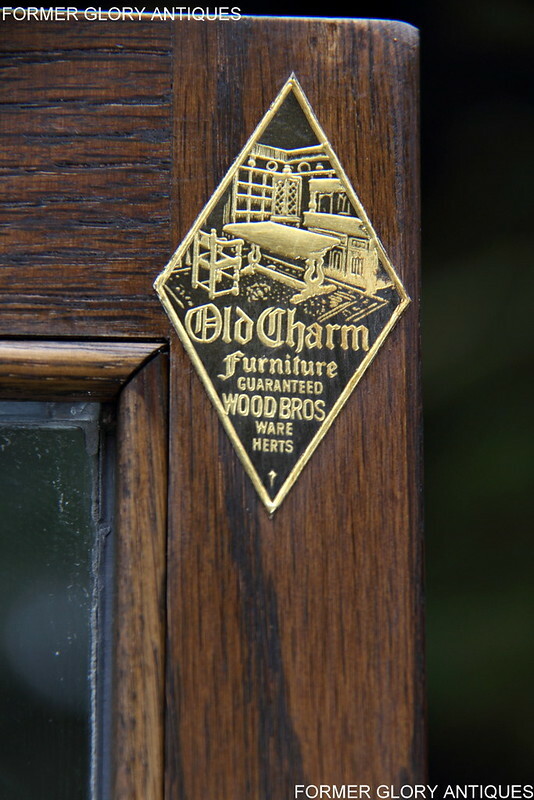 IT IS THE FAMOUS 'WOOD BROTHERS' 'OLD CHARM' FURNITURE COMPANY, OF LONDON ROAD, WARE, HERTS, ENGLAND. 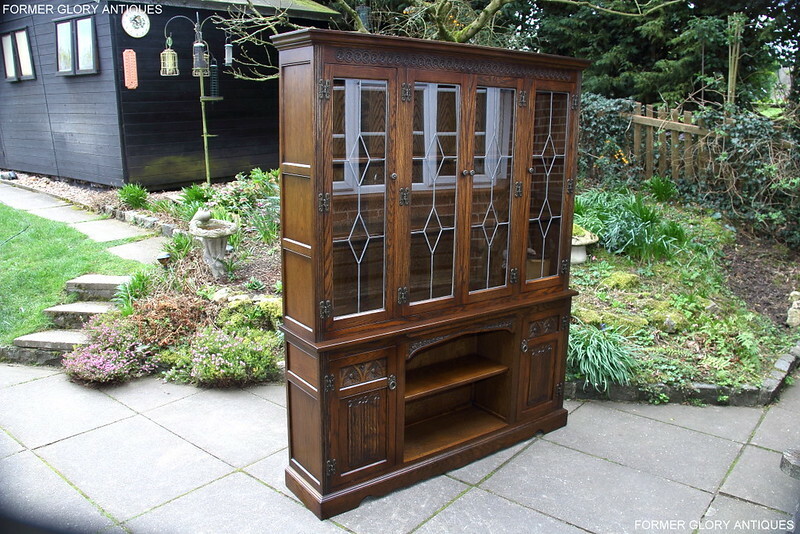 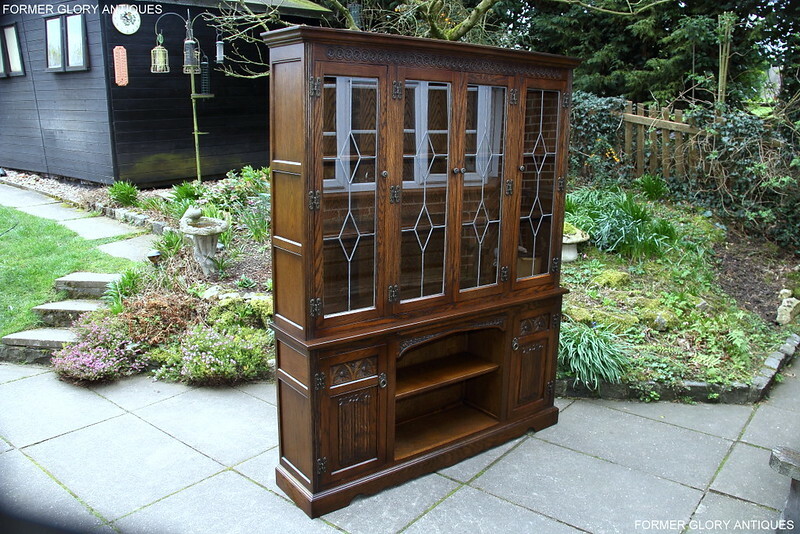 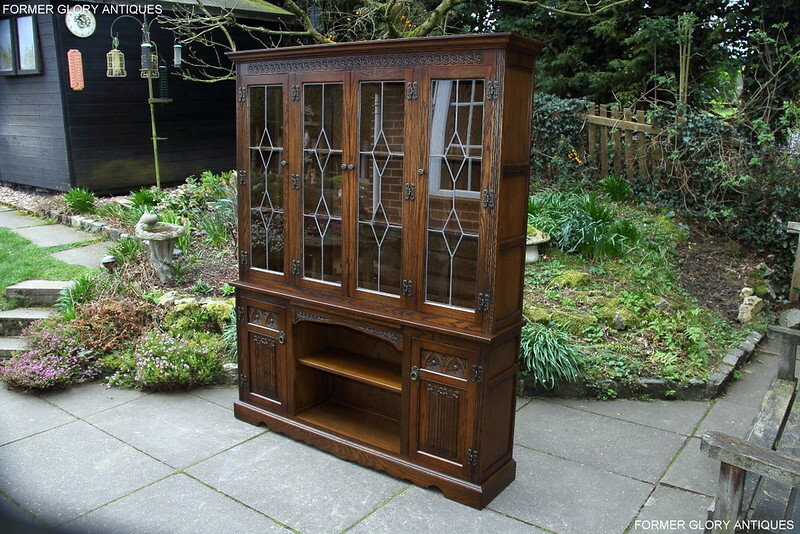 THE BOOKCASE IS PART OF THE VERY POPULAR 'OLD CHARM', 'LIGHT OAK' RANGE', MODEL No.2290. 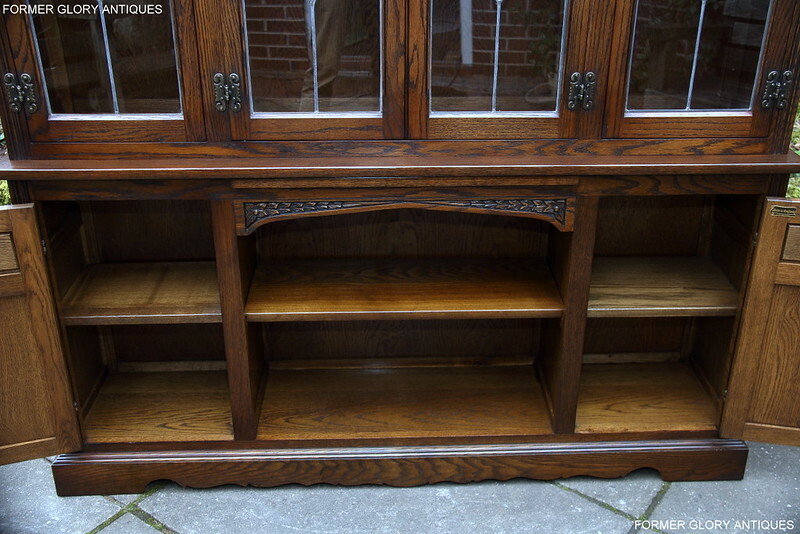 IT HAS ATTRACTIVE OAK-WOOD GRAINING THROUGH-OUT AND WOULD SIT NICELY WITH OTHER MATCHING 'OLD CHARM' ITEMS OF FURNITURE. 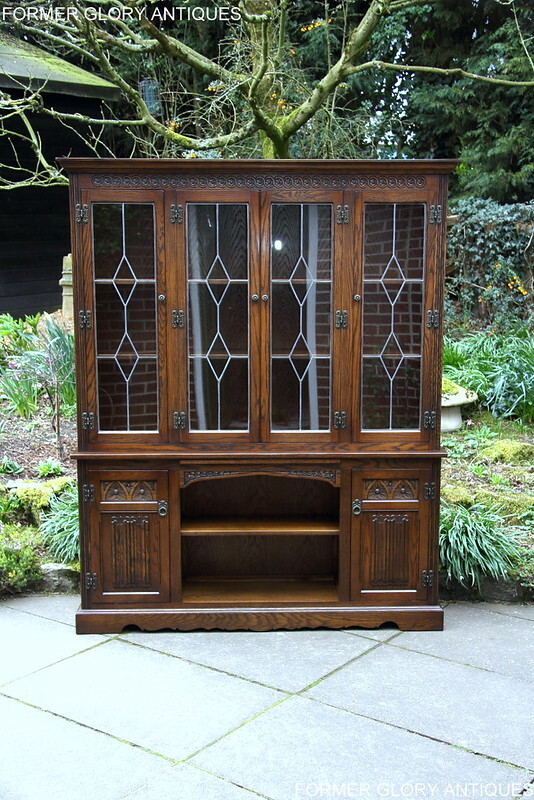 THE BOOKCASE HAS A LARGE REMOVABLE TOP SECTION, WHICH HAS AN ATTRACTIVE MOULDED CORNICE RUNNING ACROSS THE TOP, WITH A DECORATIVE 'GUILLOCHE' CARVED BORDER / FRIEZE BELOW. 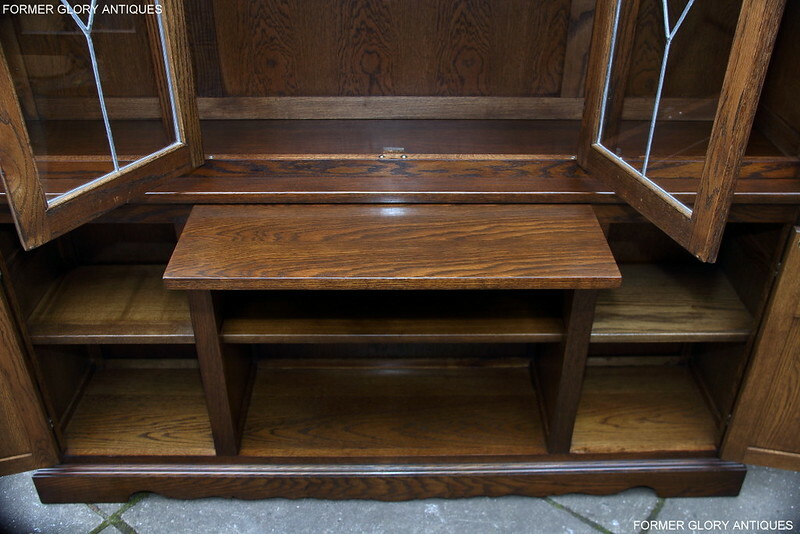 THERE ARE TWO LARGE, SOLID OAK, REMOVABLE SHELVES INSIDE THE TOP SECTION, WHICH MAKES IT IDEAL FOR DISPLAYING BOOKS / DVD'S / CD'S ETC. 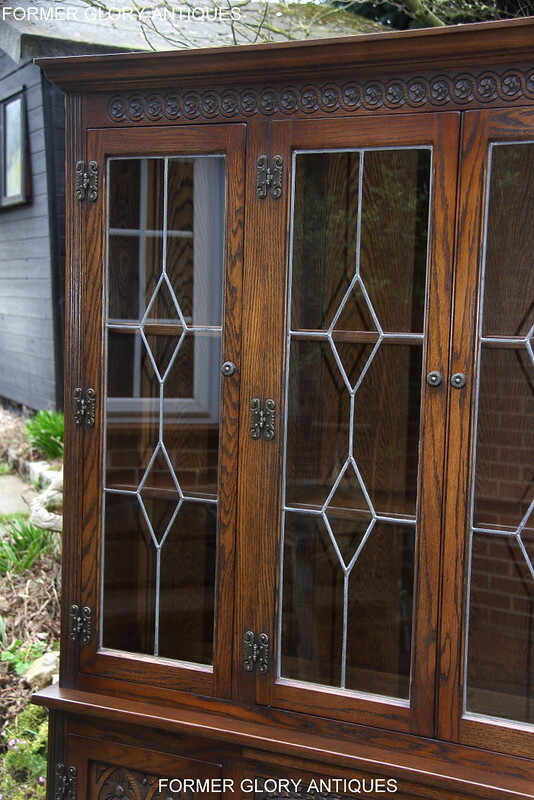 THERE ARE FOUR LARGE OAK DOORS WITHIN THE TOP SECTION. 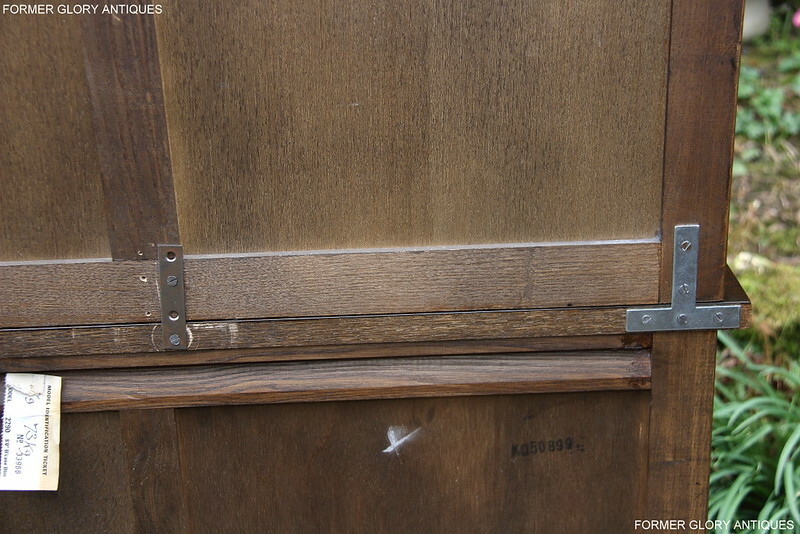 IT HAS TWO DOUBLE DOORS IN THE CENTER, WITH A SINGLE DOOR AT EITHER SIDE. 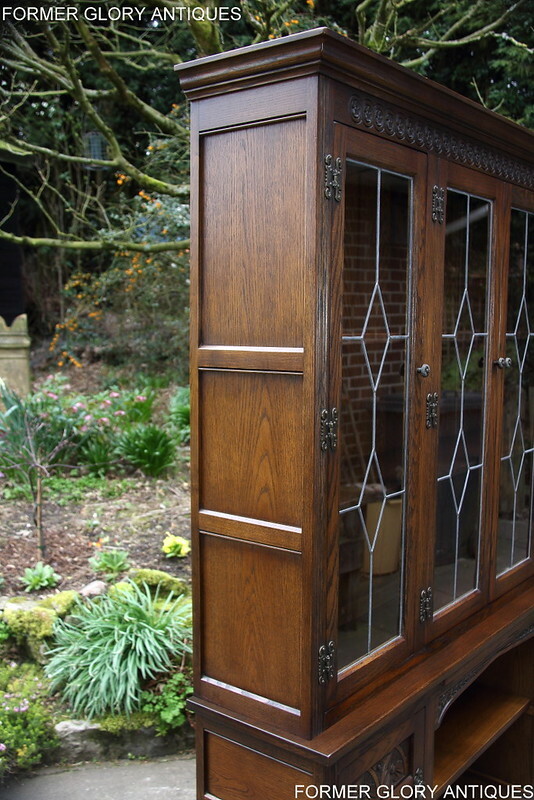 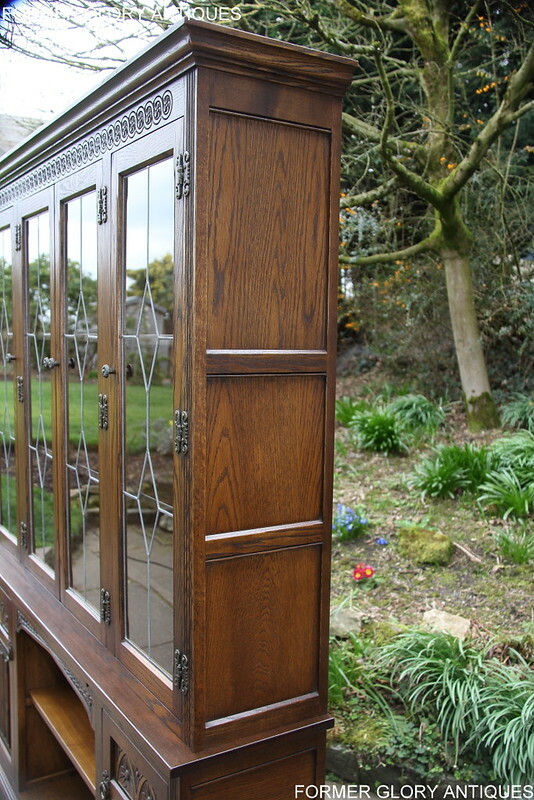 THE DOORS ALL HAVE SOLID OAK FRAMES, HAND MADE, LEADED LIGHT, INSET GLAZED PANELS AND THEY RETAIN THEIR ORIGINAL 'GOTHIC STYLE' HINGES AND MATCHING STEEL KNOBS. 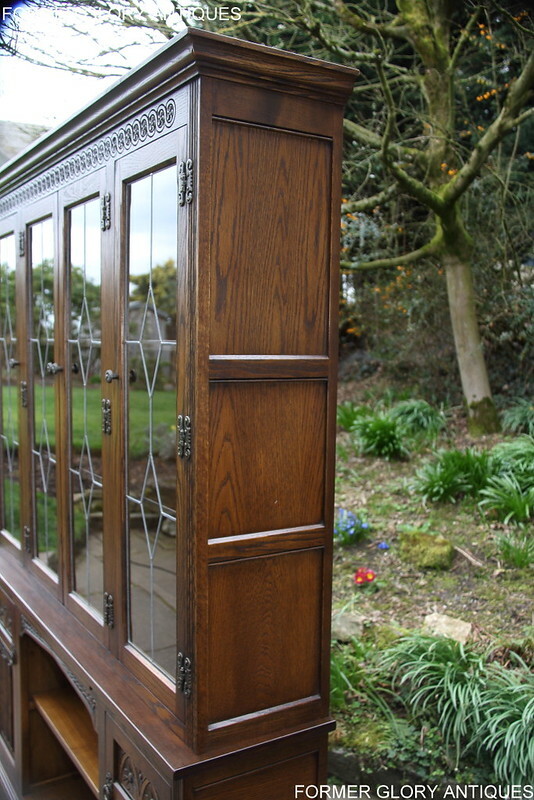 THERE ARE ATTRACTIVE INSET OAK SIDE PANELS, ALL WITH CHAMFERED / BEADED BORDERS AND ADDITIONAL SCREW-HOLES AT THE FRONT TO SECURE THE TOP SECTION TO THE BASE. 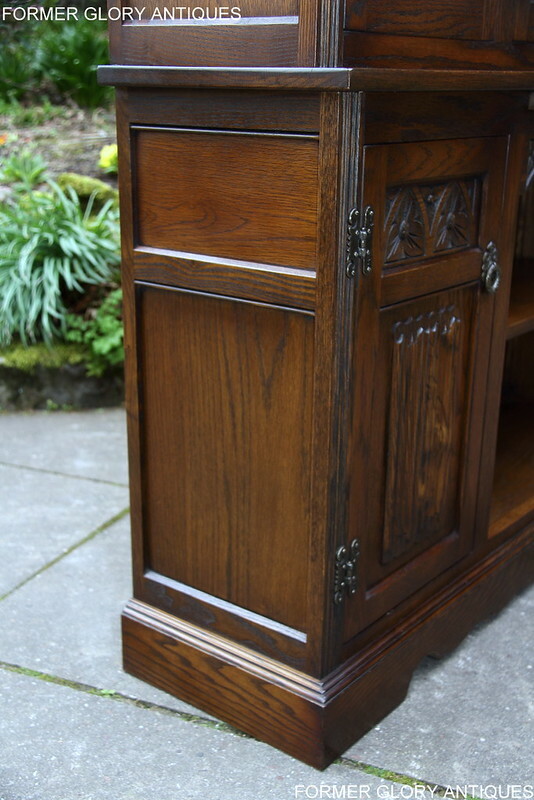 THE BOTTOM SIDEBOARD SECTION HAS A BEAUTIFULLY GRAINED SPACIOUS, FLAT TOP, WITH TRADITIONAL STRAIGHT-CUT EDGES. 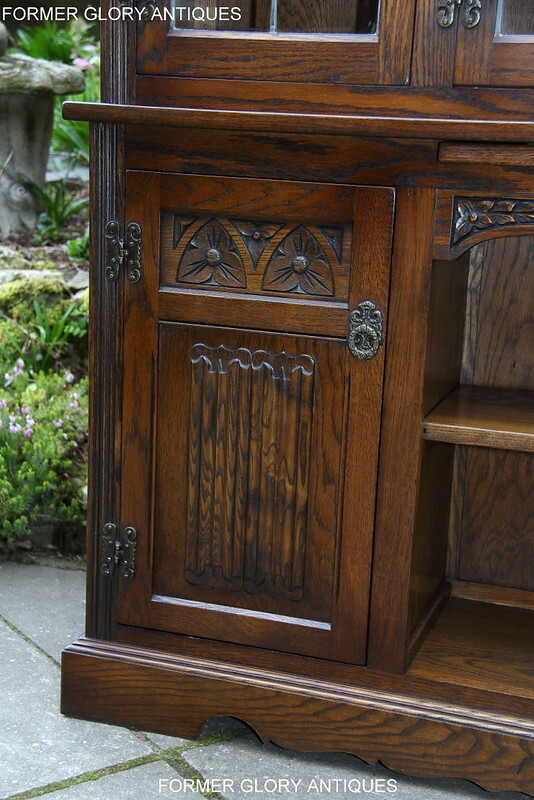 THERE IS A CENTRAL OPEN STORAGE SECTION IN THE BASE, WITH A 'CACTUS FLOWER' CARVED ARCHED FRIEZE ABOVE. 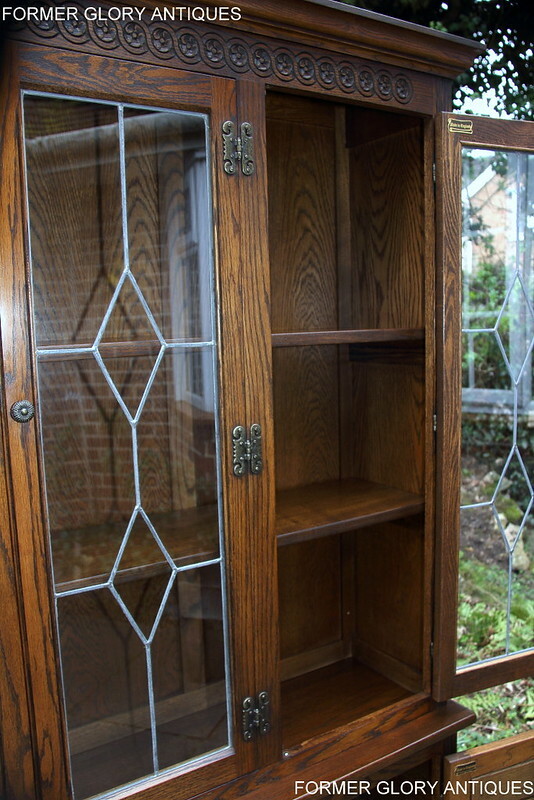 THE OPEN STORAGE SECTION HAS A SINGLE REMOVABLE SHELF INSIDE AND IS AGAIN IDEAL FOR STORING BOOKS / DVD'S / COMPUTER GAMES ETC. 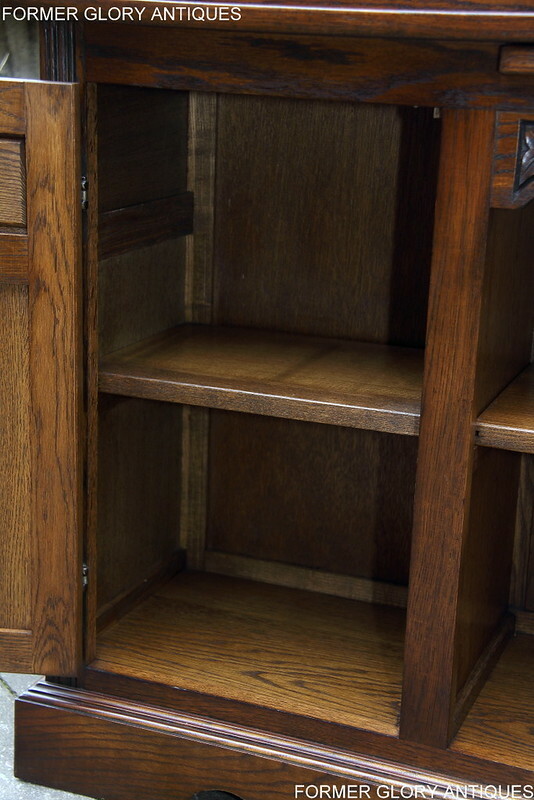 THE BOOKCASE ALSO HAS A SECRET 'PULL-OUT' BOOKSHELF / READING SLIDE IN THE MIDDLE, WHICH IS COMPLETELY HIDDEN WHEN CLOSED. 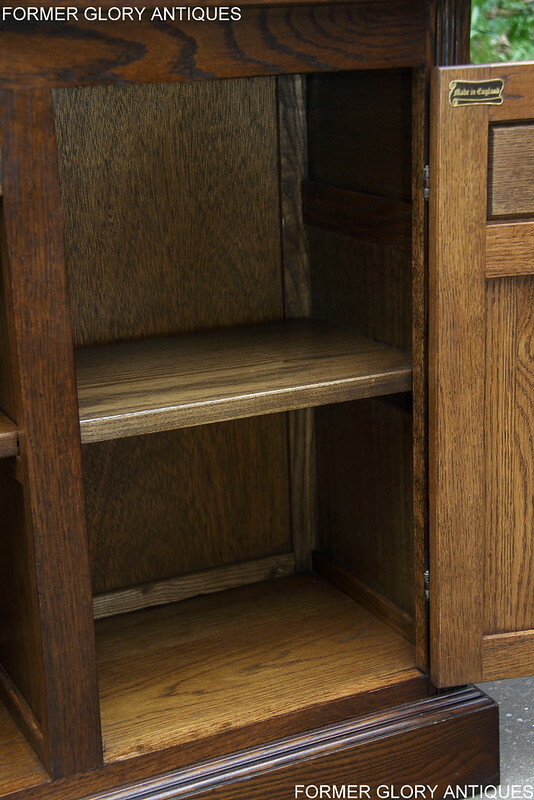 THERE ARE TWO USEFUL CUPBOARD SECTIONS IN THE BASE, EACH HAS AN ADDITIONAL FIXED SHELF INSIDE AND AGAIN THEY PROVIDE EXTRA STORAGE SPACE. 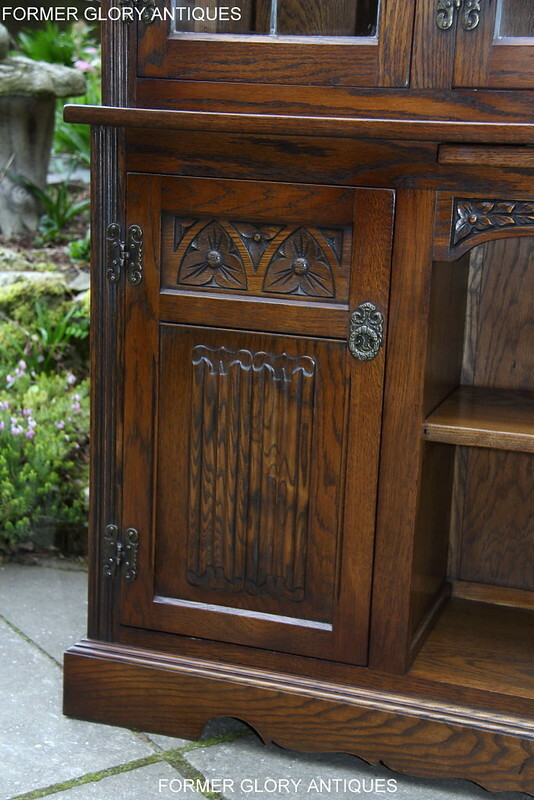 THE CUPBOARD DOORS HAVE ATTRACTIVE INSET OAK PANELS, DECORATED WITH THE 'OLD CHARM' 'CACTUS FLOWER' AND 'LINEN-FOLD' DESIGN MOTIF CARVING, ALL WITH ADDITIONAL CHAMFERED BORDERS. 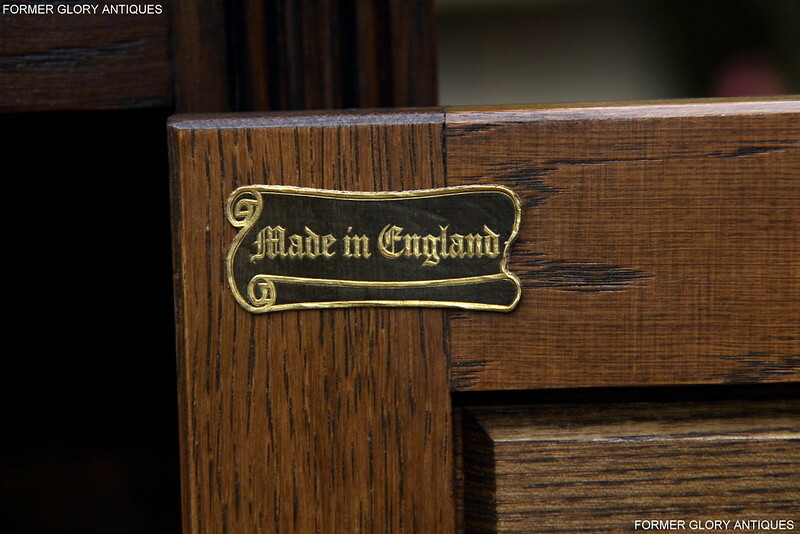 THE DOORS AGAIN HAVE SOLID OAK FRAMES, THEY ALSO RETAIN THEIR ORIGINAL, 'GOTHIC STYLE' STEEL HINGES AND MATCHING 'RING-PULL' HANDLES. 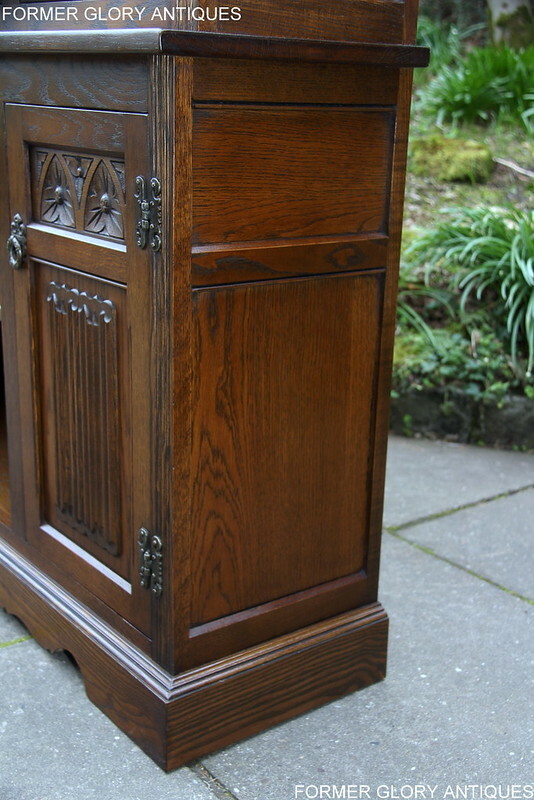 THERE ARE TWO INSET OAK PANELS TO THE SIDES OF THE SIDEBOARD SECTION AND IT STANDS ON A TRADITIONAL PLINTH BASE, WHICH HAS A MOULDED TOP EDGE AND ADDITIONAL SHAPING TO THE FRONT SECTION. 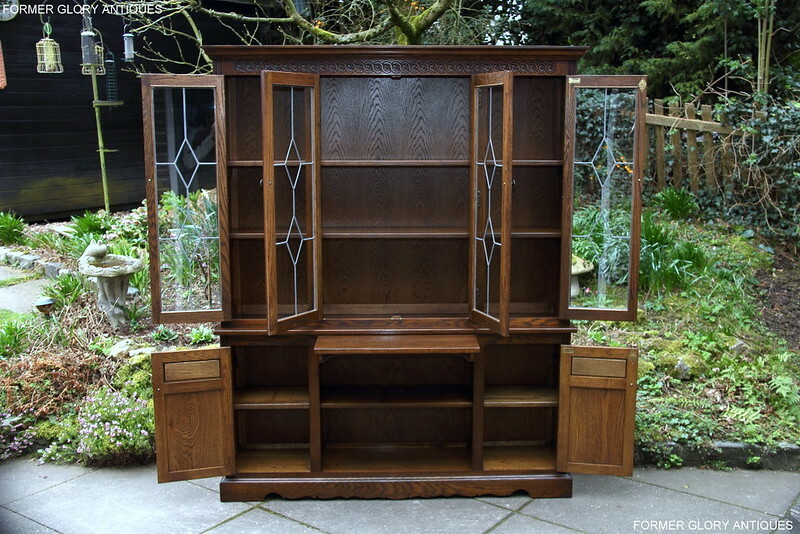 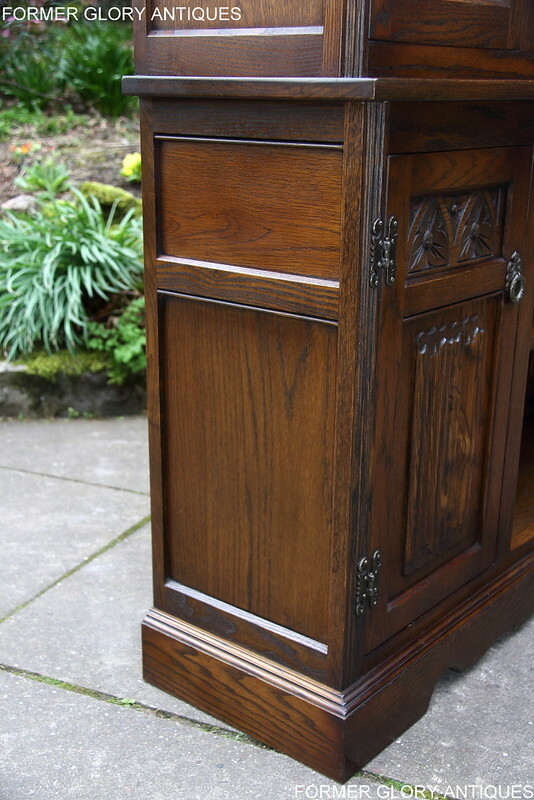 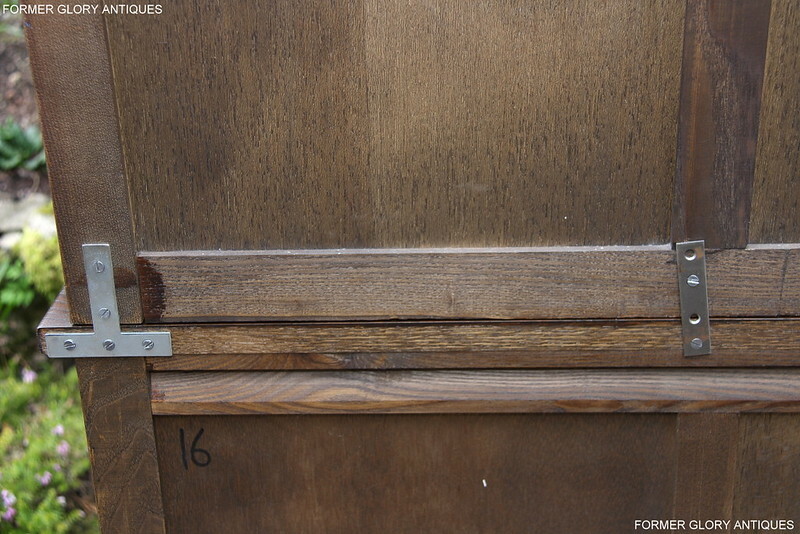 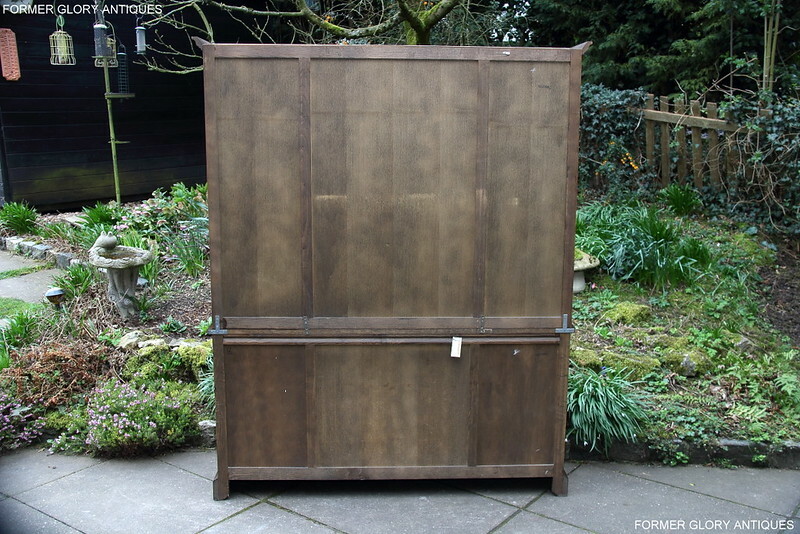 THIS SUPERIOR QUALITY 'WOOD BROTHERS' 'OLD CHARM', 'LIGHT OAK', 'LIBRARY BOOKCASE' RETAINS IT'S ORIGINAL SALES LABELS. 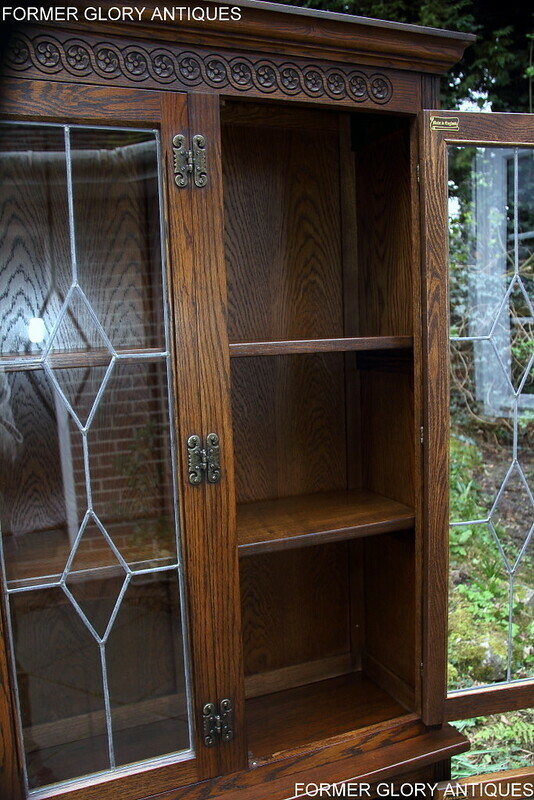 IT IS IN EXCELLENT / NEW CONDITION THROUGH-OUT, WITH ALL 'WEAR AND TEAR' / ''MINOR MARKS FROM USE'' / 'CHARACTER' (DAMAGE) BEING REMOVED. A STYLISH CARVED OAK BOOKCASE THAT WOULD BE A VERY USEFUL AND ATTRACTIVE ADDITION TO ANY HOME / OFFICE. 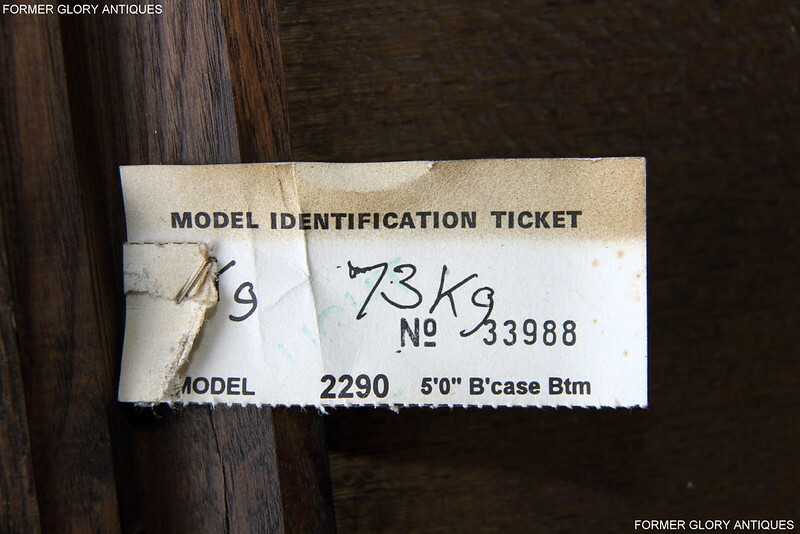 HEIGHT 66 1/2", WIDTH 60", DEPTH 13".